The incident at Jacutan Archipelago changed Jack Carver's life forever. In Far Cry Vengeance Jack has had little choice but to embrace the disturbing talents unleashed by Krieger's unique brand of folk medicine. Back at his home port in Micronesia, Jack thought he had finally found paradise. But when a gorgeous woman draws him in on a dangerous heist, their sun-drenched days take a chilling turn. Hunted for a murder he didn't commit, Jack must draw on his most savage instincts to make his predators his prey. Dig deeper into the power of the Wii Remote and Nunchuk through survival tactics that include driving, shooting, jumping, balancing, climbing, grenading, and Far Cry's ever-popular Feral attacking. Choose from a variety of weapons in a struggle to endure the rebel-infested jungle. Take down an unsuspecting victim from behind with a machete or meet the fight head-on with your machine gun. From ATVs to hovercrafts, pickup trucks to Jet Skis, drive over, around, and through vicious combat situations. Utilize the lush, tropical surroundings to your advantage, using stealth to sneak through the foliage past unsuspecting rebels. Feel what its like to be the predator, not the prey, as you unleash the beast within. Jump higher, run faster, and slash with more fury than all of your enemies combined through the animalistic feral abilities unique to the Far Cry series. 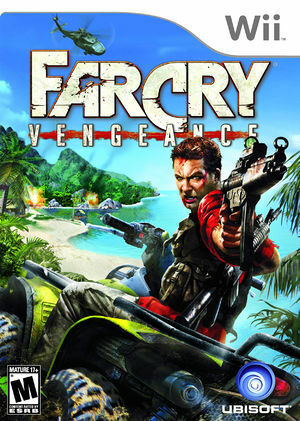 Challenge your friends in Far Cry Vengeance's frenetic Chaos mode as you battle to be the last person standing. At the very opening of the game before the main menu, there is noticeable flickering during logo videos. This can be avoided by setting Texture Cache Accuracy to Safe. No other videos or features in the game seem to need it. Refer issue 10705. For some reason, the game seems to think that the emulated Wii Remote is too close to the screen. To fix, hold the key to pull the Wii Remote away, or use Real Wii Remotes. Music and most sound effects will not play. Fixed by 5.0-5395. The graph below charts the compatibility with Far Cry Vengeance since Dolphin's 2.0 release, listing revisions only where a compatibility change occurred. This page was last edited on 5 March 2018, at 08:16.